If bookshelves were organized by substance -- rather than by author or subject area -- I would shelve PROPERTY between Karen Hesse's young adult novel in verse, WITNESS, and Edgar Lee Masters' SPOON RIVER ANTHOLOGY. And yet it's not "like" either, except in the sense that I long to experience it in performance. The one time I've heard it read aloud, there was only one reader. And that can't capture the sense of courtroom argument and the piling up of points that its centerpiece sequence, "Deposition," offers. anything to just hold on. But the neighborhood is defined by categories: the Polish man, the Black ones. And the weight of the past, of the prejudices on which each has climbed and trampled the ones at the bottom, turns an observation of "They didn't mean to hurt anyone" into a decision to pay neighbors to leave. This almost familiar situation twists in the hands of the poet to become a distorted reflection of how European settlement of America trampled on the lives of the land's original inhabitants, and at the same time on the lives of Blacks who arrived from Africa and the Caribbean islands. A dangerous question that is itself an objection and an overruling. Eventually the volume title PROPERTY becomes a double label: for the "stolen land" and for the "stolen people," the slaves and indentured servants who lost so much more than their inheritance. So PROPERTY becomes a volume to "consider prayerfully" or "see mindfully" as America's Independence Day arrives again. Whose independence? And at what cost? In one of the concluding poems, Agoos proposes that the past is "clean," which clearly she has already demonstrated is far from the truth. Her narrator protests, "it was all so long ago," and tries to "close the book / on someone else's life." We who follow take on the challenge that Agoos offers become certain: The book of history, of human lives, must stay open. Restoration and redemption are in some much later section of our volume. When Charles Simic declined a second year as US Poet Laureate, he said his choice was to spend time writing poetry. This year he brings out two volumes -- a collection of his own new work, and a complex and deep set of translations. More about those another time ... but thinking about Simic's choices has brought my nose repeatedly to the glass of translation, seeing how it can provoke hungry roots to digest even stone, to nourish the stem, the stalk, the trunk, the branch. So in reading and re-reading Jane Mead's 2008 volume THE USABLE FIELD, I brought this inner nudge. Well, we all do, don't we? But this one, at least, I recognized in advance. The tongue and its entanglements, the brain's predisposition to speech, the growth of a second soul along with a second language: Mead's poems take words and phrases and rattle them together until they translate the outer world into an inner one. How can you say what "bird" really means? And how can you name the wings-breast-tail-throat such that you speak the song? And it is the word-unfettered minds of trees, grasses, and animals that rattle the chants of this collection. For Mead writes in "The Part -- and the Whole" that "Stocking the globe is not / my issue, taking stock / is my issue." Later, she offers a sequence of this inventory: "the integrated lives of ants / and geese, the upturned / feet of dead rodents: corrupt // parade -- as in this labor / leads to blood in the heart." Or, in another poem, "the bird / with the blue feathers, the brown bird -- / the same white breasts." And later, "oak, manzanita and bunchgrass." The creatures and earth-sprouts offer back an echo of grief, loss, and letting go, becoming the song of this poet: "streaked sky waits -- as if for / a flickering-of-wings which it cannot / contain. As if for the flinch // in your voice. -- Which it can." One poem whose repeating fragments I especially enjoyed is "The Habit of Resistance," which asserts, "Each fall / a new beginning. // The wings in the trees / are black. The buildings / crumble, the asphalt / cracks. Every spring / we count the dead." And as the wings in the trees wheel back again, a rare direct statement follows: "We carry / our grief whole, / we carry our lives. Swayed // by the under-self, / it's how we love." There's one argument of poetry that never resolves for me: the one that says either that a poem "should be" accessible, or "should be" complex -- or at least, address complex matters. I cut my poetry teeth on T. S. Eliot and William Carlos Williams in the same year, the same months, and both bodies of work suited me at the time. Increasingly often now, I find I need to read a new collection of poems several times, well spaced apart. Part of this is for the sake of adapting to forms or approaches that startle me, until I find the words digging into my soul. And part of it, I suspect, is that as I age, I protect my soul more successfully -- so it takes time for a fresh blade to reach the blood. Now that I've read ALPHA ZULU three times, I like it enough to know I'll be reading it at least three more times. Don't ask me to explain, but when I first saw the collection title, I thought it was going to be "about" roots in Africa. As far as I can tell, it's not ... but Alpha and Zulu are the beginning and ending characters of the military and police verbal symbols to express the alphabet as certainly as possible in confused communication situations. And that is what a decent poem often does: takes us into confusion and calmly lays out the bones, the lines, the certainties. The book opens with the title poem and an unforgettable first line: "I know more people dead than alive, / my insomniac answer to self-addressed prayers // is that in the small hours even God drinks alone." In a deft sweep of eleven couplets, Lilley captures life, loss, love, and a matter-of-fact acceptance of hope. and I wake in the sun-touched room. and one hundred fifty squids. not to think of you too long. Handled especially cleanly are the threads of addiction, recovery, and belief -- or as the expression goes in the 12-Step rooms, "I came, I came to, and I came to believe." When GOD shows up in "Ranter on the Corner of Babylon and Manhattan" it's in an all-too-real rant of a brain going it solo, and again the meticulous pruning of this poet means that each phrase comes through intensely, like "traditions and bushels of burning chads look how they run amuck in front of God's annoyed hands" or "I got history on a deadline I got hell fear on ice." In my third time through, I got to thinking of the prose poems in here -- the rants -- as each being a separate voice, one of the thinking reeds bundled inside Lilley. Or inside me. And that, I think, may be the ultimate compliment to this collection: that the more I thought I could see Lilley in what he wrote here, the more I thought I was seeing something of myself. Wednesday July 1, at South Congregational Church on Main Street in St Johnsbury, just down the road from the town's noted Athenaeum, which is sponsoring the reading. Be there by seven or sooner, to get a good seat. And to add to the fun of the day, KINGDOM BOOKS will host a poetry open house from 11 a.m. to 5 p.m. that day, so you'll have a chance to come browse the room-and-a-half of poetry, talk about new and classic work, and maybe even pick up some of Hall's masterworks while you're here. To get into the mood, I'll be posting review of quite a bit of poetry over the next few days. Stay tuned. It was a hot summer night in Vermont on Thursday, hotter than the Boston morning that Dave and Judy Zeltserman had left behind them. They arrived early for the 7 p.m. reading event, which was great, because the readers and collectors pulled in here early, too: To put it in a nutshell, after reading one or two of Zeltserman's quirky crime novels, meeting him becomes a "must" -- to find out how these crazy ideas are spun from a quietly married New Englander who loves the Red Sox almost as much as his wife. The air conditioner did its best, and the crowd gently dipped into icy lemonade and fresh strawberry shortcakes and Boston cream cupcakes, but every gaze was on Dave Zeltserman. He outlined his plan for his "man just out of prison" trilogy, which SMALL CRIMES opens up as the "search for redemption" in its weird and dark way. PARIAH, coming to the US this October, is the second in the sequence and is the "quest for revenge and to rediscover the self"; KILLER is already done and under contract, and the author says its portion of the quest is to have the ex-con "discover his true nature." In other words, there's an underlying sweetness to where DZ sees the sequence going -- but that won't mean any escape from the violence and tragedy that haunt his tales, along with that dry and wicked sense of humor. After reading a scene from SMALL CRIMES, Zelsterman tackled the opening of BAD THOUGHTS, a crossover from crime to horror. Again, he's building a sequence: BAD KARMA will come out later, and empowers the victim of BAD THOUGHTS in unexpected ways. (I've had a peek -- too soon to share the details but it's goo-oo-ood.) Then a full-length reading of a "Western noir" tale (creepy cowboy life?) followed. "Emma Sue" turns the tables, and confirmed everyone's opinion that Zeltserman may be a heck of a nice guy, married to a really sweet woman (Judy, a real-life homeopath,, which is NOTHING like a psychopath), but he writes from a childhood obsession with "The Twilight Zone" and other dark and deadly angles of sardonic despair. Love it! For those who obsess over "process," here's Zeltserman's: He outlines, and follows the outline, even though he sometimes adds characters that weren't in the orginal plan. He writes at all hours, setting a "number of words" goal that comes to about five to ten pages per day, but rarely reaches it until the home stretch. And he sums it up by saying, "I'm trying to make that page count each day, so I fell like I'm accomplishing something." PARIAH emerged with almost no revision; BAD THOUGHTS had several drafts, thanks to an editor's input, which included adding 50 pages at the start, as the editor told the author, "You've got to let the reader get to know Bill Shannon before he starts suffering his breakdown." Nope, that's not a spoiler -- BAD THOUGHTS is a lot more complex than that. And for a final teaser: Zeltserman is bringing out a story called "Julius Katz" in the Sept/Oct issue of ELLERY QUEEN MYSTERY MAGAZINE. He says, "It's my kind of tribute to Nero Wolfe," where "the Archie Goodwin character is a piece of technology." And oh yes, it's not exactly just a story -- it's a novella, about 90 pages. Can't wait to read it. Thanks, Dave and Judy, for coming north. Next trip will be our turn. Speck Press has been steadily bringing to the US market the Baantjer mysteries -- by the Dutch master of police procedurals, whose work is so popular in Europe that he's simply called forth by his surname, without even his initials much of the time (A. C., for Albert Cornelis). The latest translation, DeKOK AND THE MASK OF DEATH, was first printed in Dutch in 1987. So it's a period piece, already a classic before its July 1 release in the States. Standing in front of the station house, DeKok contemplated the worn bluestone steps hollowed out over the years by the footsteps of cops and sinners. The steps felt like a barrier, a barrier that filled him with an unreasonable feat that cooled the bright sunlight and sent a shivering chill through his bones. It was as if a strange inner voice whispered to him, urging him to forgo his life for a day and take a leap into the future. Shrugging off the inexplicable fear, DeKok climbed the steps and opened the door. To DeKok's surprise, the arriving young man at the station has had a similar experience on the same day, a sense of foreboding that almost caused him to stop his girlfriend from entering the hospital. "But I realized how idiotic my fear really was." Completely serious, the police inspector replies, "Although the immediate reason may be nebulous, fear is never idiotic." And that gives you a taste of the distinct flavor of DeKok: presented with a range of language that instantly signals "translation" (the slight awkwardness, the shifts from informal to formal, etc.) but also lays out landmarks for what is important in life. DeKok chooses where to place his trust and his willingness to believe, as well as the stubborn streak that causes him to pursue odd angles of a case. In this case, it turns out that young Richard Netherwood's girlfriend is one of four women who've vanished in the same hospital. And the reason for their disappearance is deadly serious, and absolutely up-to-date for 2009. So is DeKok's anguish as he struggles to pull the pieces together. The pace of these translations is just about perfect -- one Baantjer per year offers a chance to enjoy this return to a simpler version of Europe, where the horrors of today's international intrigue are far less important than the human needs of those who try to adjust the balance of good and evil, police and crime, toward hope. The US edition releases in hardcover on July 1. If you haven't yet started collecting this series, you'll be able to pick this one up without need for the earlier volumes. But I have to confess, it's tempting to gather the entire series, for the quiet and comfortable satisfaction that each volume manages to establish by its end. Paul Tremblay has sold over fifty short stories to markets such as Razor Magazine, CHIZINE, Weird Tales, Last Pentacle of the Sun: Writings in Support of the West Memphis Three, and Horror: The Year's Best 2007. He is the author of the horror fiction collection Compositions for the Young and Old and the hard-boiled/dark fantasy novella City Pier: Above and Below. He served as fiction editor of CHIZINE and as co-editor of Fantasy Magazine, and was also the co-editor (with Sean Wallace) of the Fantasy, Bandersnatch, and Phantom (forthcoming) anthologies. His first novel, The Little Sleep, is forthcoming from Henry Holt (March 2009). Paul is also a juror (and one of the founders) for The Shirley Jackson Awards (www.shirleyjacksonawards.org). For more information on Paul and his works, visit his website at www.paultremblay.net. Okay, that explains the "how" of Tremblay's coup -- he's been writing steadily and pushing to expland from stories to novella to the full-length detective novel. THE LITTLE SLEEP features Mark Genevich, a South Boston private investigator. He's fully licensed -- but he's got a problem that pushes clients away. He falls asleep -- yes, while they're explaining whether somebody is trying to kill them and why. Thanks to a disastrous car accident that smashed his face and skull, he's got a brain short-circuit that's given him life-long narcolepsy. So when he wakes from one of his "little sleeps" and finds blackmail photos of the daughter of a prominent Boston politico on his desk, well, it ought to be simple enough to find out who brought them to his office, right? I mean, wouldn't you think it's either the photographed young woman or her dear dad? Those are Mark's guesses. It's just too bad that in following up, he turns into a target for a murderous crew that's got a lot of advantages over him: like, not falling asleep during business. And the thing is, any tension in Mark's life intensifies his symptoms -- not just the falling asleep, but worse ones that make him everyone's victim. Brush myself off and back upstairs to the kitchen. I sit heavily at the table with the newspapers. I want a cigarette but the pack is in my coat and my coat is way over in the other room. My legs are too heavy. My arms and hands are too heavy. If I could only get around without them, conserve energy, throw the extra weight overboard so I could stay afloat. Can't get myself out of the chair. You never get used to the total fatigue that rules your narcoleptic life, and it only gets more difficult to overcome. Practice doesn't make perfect. Sure, you can compare this to Jonathan Lethem's 'tec with Tourette's syndrome, or to the TV show "Monk." But Tremblay is carving out his own territory, with an unforgettable character. Just for thinking, though, here's a little mention from Hoppenstand and Browne's classic book THE DETECTIVE DEFECTIVE IN THE PULPS: "... a crime/puzzle is presented -- and solved -- by the detective hero. Variations of the formula usually revolve around the method of investigation, the means and the motive of the criminal, and of course, the personality of the detective. They may be fat; they may be thin; they may be gregarious or withdrawn, hard-boiled or soft-boiled, violent or peace-loving. They might collect butterflies ... or guns. THey may be loved by the police, or wanted by them. In any event, the detectives's eccentricities paraphrase his style, and his style communicates his individuality." Thanks, Paul Tremblay, for an individual whose style works its way into a heck of a book. Here's a series of top authors, held in one of New England's historic meetinghouses, not far from West Lebanon, NH. Each event includes an author reading and book signing. For more info, see www.meetinghouse.us. Hardly anyone in New England has heard of crime author Dave Zeltserman, which is as much a mystery as his books: Author of four published and highly recommended "dark" crime novels, Zeltserman lives just outside Boston in Needham, Mass., and with his first film option signed and six (yes, six!) more books under contract for 2009 and 2010, he's hot in the crime fiction scene. But his first few books either had small press runs or were released first in Britain, far from the American news media. As a result, American reviews won't explode with news of this talent until September of this year. Well ahead of that time, Zeltserman is scheduled to visit the Northeast Kingdom this summer. So it's a good moment to read his most available title, "Small Crimes" (Serpent's Tail, 2008). Set in the small fictional town of Bradley, Vermont, "in a valley on the edge of the Green Mountains," "Small Crimes" hints at what drug addiction can do to a community; it's a grim and explosive thriller featuring a "cop" gone bad -- one small crime at a time. When Joe Denton gets out of prison early, his ability to rationalize each bad decision makes him a disaster in his community. Even his estranged wife and children fall prey to his small-minded lurch into danger and crime. 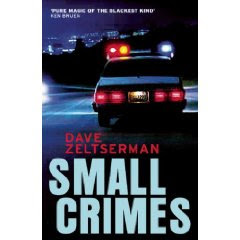 Zeltserman's consummate skill in painting the irrational compulsion of evil makes this fiction intensely believable, to the point of making a reader wonder what the day's "police news" in any local paper might hide. Zeltserman's work has already been compared with James Ellroy, a writer of classic noir (dark) fiction, and with other classics of the genre by James M. Cain ("The Postman Rings Twice"). In "Bad Thoughts," Zeltserman probes the nastiness of the criminal mind in a way that recalls Jeffrey Deaver's series featuring Lincoln Rhyme (which includes the film "The Bone Collector"). In "Bad Thoughts" the action opens inside a nightmare that Bill Shannon, a cop in Cambridge, Mass., is having -- one in which he's bring forced to pick up a knife and kill someone. That's disturbing enough. But the horror doubles when Shannon realizes that women are being killed in exactly this way, while he endures his dreadful dreams. They date back to the death of his mother when he was just 13 years old. Also haunting him are blackouts, perhaps linked to his own drinking, that plague his adult life. They cut in around the same time each year, the anniversary of his mother's death. Since Shannon doesn't know what he's done during his time away from himself, and his wife and best friend fail to figure it out either, the creepy suspicion among all of them is that Shannon may be the killer. Even of his mother. 'Where else would I be?' he said after a while. Zetserman's newest work, "Pariah," has already made waves in England and will be available in America in October. At the same time, his new "Bad Karma" will be published, moving away from New England settings. Perhaps the most astounding aspect of this novelist is the fact that in person, in spite of his dark imagination, he's a nice guy, married, happy, and excited to have his work finally making a splash. After years of hard work and a passion for crime fiction, Dave Zeltserman is getting a reward. Thank goodness, it's a far different one from what usually happens to the characters in his novels. The Crime Writers’ Association is delighted to announce the shortlists for a number of this year’s Daggers — the prestigious awards that celebrate the very best in crime and thriller writing in 2009. When nominations closed on 17 April, 988 entries had been put forward for the seven daggers in contention this year. The winners will be announced at a drinks reception held at the Tiger Tiger nightspot in London on the evening of July 15. At that event, the shortlists will also be announced for the Gold, John Creasey (New Blood), and Ian Fleming Steel Daggers. The winners in this second group will be announced in the autumn. The Shortlists All shortlisted books had their first UK publication in the year from 1st June, 2008 to 31st May, 2009. Unlike most other literary prizes, the Dagger in the Library is awarded not for an individual book but for the author’s body of work. Authors are nominated by UK libraries and Readers’ Groups and judged by a panel of librarians. Previous winners have included Stuart McBride, Craig Russell and Alexander McCall Smith. The £1500 prize is sponsored by the publishers Random House. In addition, the participating libraries’ readers groups that nominated the winning author will be entered into a draw for £300 to be spent on books for their group. Andrew Taylor was presented with the 2009 Cartier Diamond Dagger, at a ceremony held on April 28th at the Gore Hotel in Kensington, London. The Diamond Dagger, awarded for sustained excellence in crime writing, was presented by Arnaud Bamberger, the Managing Director of Cartier UK. 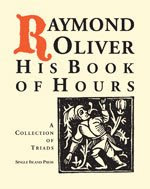 The Ellis Peters Historical Award is made in the autumn for books published between September 16 2008 and September 15 2009. The closing date is August 1 2009. The non-fiction dagger is now awarded every other year and will next be in contention in 2010. To qualify for entry books must have been published between 1 June 2008 and 31 May 2010. C.D. Wright, a National Book Award Poetry judge in 2007, has won the 2009 Griffin Prize for International Poetry for her book of poems Rising, Falling, Hovering. Established in 2000 by industrialist Scott Griffin, the annual prize is worth $50,000. The jury chairman said Wright is a "work of harrowing power and genius" by "America's most original, daring, and scary poet." John Ashbery's Notes from the Air: Selected Later Poems won the Griffin Prize in 2008. Ashbery, whose work spans five decades, is a four-time National Book Award Poetry Finalist. He won the Award in 1976 for his collection Self-Portrait in a Convex Mirror, which also received a Pulitzer Prize that year. More info on the Griffin Prize here. Four lovely books framed around the Japanese poem/prose forms have been released by Single Island Press of Portsmouth, New Hampshire. Each invites long-term exploration, a passage into relationship with both meaning and shape. 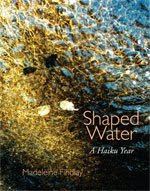 Single Island Press was founded in 2006 by Madeleine Findlay to publish contemporary work inspired by the haiku masters Bashō, Buson, Issa, and Chiyo-ni. Today it is a multi-purpose facility serving the Portsmouth community and beyond. It would take a persistent student of these forms to adequately explore the four books. Since I'm rarely involved with them -- a bit of correspondence with Cid Corman and a liking for David Budbill's poems have encouraged me to appreciate brevity, but I am limited to saying "I like what I've read" -- I'll give a simple description of each of the four books as I see them. The press descriptions are at www.haikumuse.com. Many of the poems hint at a fragility of moments and of life itself. 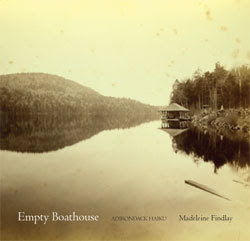 Single Island offers another Findlay volume: EMPTY BOATHOUSE, ADIRONDACK HAIKU. Again the collection extends over the passage of a year, but this time there are graphics, especially tender and moody images of earlier times: women in graceful Victorian garb, boats, old pine trees, quiet lakes, and an occasional teasing view of men and families as well. The words here play against a sense of place-bound history. This volume is larger, about six by eight inches, and elegantly laid out. A sense of haiku as combined of mountains and rivers adds to its impact. AUREATE peach and blue of mellow dusk! Whose fruit is no less fragrant than its dust. Tom D'Evelyn's ACCIDENTAL PILGRIM is the only narrative volume among these four offerings. Designed in an intriguing accordion-folded sequence of pages, the book is a single poem with roughly page-length portions, each ending with a three-line haiku-type stanza that savors the contrast of ancient Rome and the current city with all its history and personages. The title is drawn from a part of the third segment of narrative: "Sometimes a tourist becomes an / accidental pilgrim, catches a view of / the making of his soul." I found the combinations delicious, and paused several times to read more about the topics and individuals, such as Margaret Fuller and the Trastevere. I think the ultimate summer indulgence would be the purchase of all four of these (directly from the press web site) and carrying them around from hammock to beach to shady solitudes, until a decision of which ones to keep and which ones to give to dear friends coalesces. Why not? Rarely do authors range as widely from book to book as Vermont author Philip Baruth. From an almost unknown fantasia that celebrates The Grateful Dead, to the evocative novel-in-stories "Dream of the White Village," to "The X President," there are few similarities other than a driving sense of narrative and passionate description. Last month, Soho Press released THE BROTHERS BOSWELL, Baruth's first historical thriller. The novel is laid out in parts -- of which the first three, narrated by John Boswell, report John's determined pursuit of his brother James and James's patron, Dr. Samuel Johnson. Johnson, of course, is shaped on the historical personage known as "Dictionary Johnson," who took the literary world by storm in England's late 1700s. And James Boswell was his devoted attendant, describing his social world as well as his admired friend in "The Life of Johnson." The book became known as "Boswell's Life [of Johnson]" and marked out new turf in social documentary. Baruth took a small mention of James Boswell's brother John and allowed a personage to grow from this sidewalk crevice of literary history. In this relentlessly paced thriller, John Boswell has recently been released from an insane asylum and is stalking the two men most important to him. Is he mad? Or was he unfairly detained in some vile plot of family and friends? Abruptly, in part four of the volume, narrative shifts to a third-person form that centers on James Boswell instead; then the brothers' voices take alternating segments as the chase accelerates and potential murder comes closer. ... what sours the joke is what I see as I descend the long line of stone stairs: a small crowd of people, maybe twenty-five or thirty of them, grouped around the gray granite well, which looks like an eight-foot sentry box but for the fact that it has no windows. The vessels these people have brought are spread out over the cobblestones in a long, ragged, snaking line. It is mostly women, maid-servants and caddies and fishwives, and the men are mostly boys a good deal younger than myself. The few grown men are on the oldish side, smoking pipes or seated in the windbreak where the stairs empty out into the Cowgate. Most of the crowd stands together in small knots of talk, only their casks and buckets holding their places in line. Some turn their faces to look up as I draw nearer, but they turn immediately away as the suit works its magic. The scene is an ordinary one in the life of the city where the brothers Boswell reside, but James is about to lose all ordinariness of his own. He states, "I've been making my first fumbling attempts to reconcile love and affection with lust and rejection." Deftly, Baruth tangles the curtain ropes of the stage, until madness seems to underlie reality itself, and what has been most certain becomes a dream -- until a clue again suggests that this too is imaginary. I know, I sound bewildered. In some ways, I am -- the narration, the twists, the loves and lusts of the three men in the tale are Shakespearean in their costumes and changing voices. So if you love a good Shakespearean drama, this novel is likely to suit you admirably. Madness and murder: ah yes, Macbeth. Think of the power of that one. Baruth's presentation is drawn from the same well. One of the things the local English teachers work very hard to get across to the students is that just because the "voice" of the novel, or poem, says something happened or is true or feels a certain way does not mean that the author feels the same way. As we get close to our visit from Dave Zeltserman -- he'll be at Kingdom Books on Thursday June 25, at 7 p.m. -- I keep reminding myself that he's a nice guy. Just because he can imagine and WRITE like this doesn't mean his world is that twisted. It's a good thing to remembers. Because in SMALL CRIMES, Zeltserman's 2008 crime novel (published in Britain but now available in the US), every scrap of self-justifying evil that could possibly take root is growing. Fast. The book opens with a hopeful scene: Our narrator Joe Denton, once a cop, is about to leave prison. He's apologetic for his crimes; he plays checkers with the warden; his years locked up for arson, attempted murder, and maiming a district attorney seem to have cleaned him and made him fit for civilization. The thing is, Joe never did anything with full intent to create damage and destruction. Things just seemed to happen to him. And now, released to live with his parents (who are reluctant to have him home) and accosted by a pretty girl who seems to get off on his having once been "bad," it looks as though life is about to give him a soft, sweet time under parole and probation. Once the pretty young woman's motive comes clear, so do Joe's habits. One small action after another, sometimes with really really good motives, he's going down. Oh, so far down. Let me know if you recognize anybody you know, as you keep reading. Frankly, I couldn't put the book down, even though my stomach clenched, my head started to ache, and I started thinking about going to a self-help group, fast. He was breathing heavily, his breath stale and oppressive, a bit like rotting garbage. I had to force myself to keep from stepping away from him. Then the moment passed. His eyes came back to life and his smile loosened into something more recognizable. He shook his head as if to indicate that I was nuts, and then sat back in the chair and crossed his legs. ... "So, Joe, how are you going to take care of this?" As I looked at him I knew he meant what he said. He casually took his revolver out of its holster and rested it on his knee. I knew I was a breath away from being a dead man. Fellow crime writer Ken Bruen called this novel "pure magic of the blackest kind," and Ed Gorman, longtime editor and reviewer, labeled it "one of the finest dark suspense novels I've read in the past few years." I can tell I'll be reading it again, to try to figure out how on earth Zeltserman DOES this. But it's not a one-shot skill -- with three other top-notch noir novels already in print, six releases under contract for the next two years, a film option, and more, Zeltserman obviously knows what he's doing. Come meet him at Kingdom Books. We'll serve strawberry shortcake and keep the lights on. Seating is limited and so are the copies of the books (this one, plus BAD THOUGHTS and PARIAH), so let us know if you're coming: dknel@charter.net or 802-751-8374. And if you just can't get to northeastern Vermont for this one, but would like a signed copy of one or more of Zeltserman's books, let us know that, too, along with how you'd like yours inscribed. I won't write a lot today about Henry Chang and his Jack Yu investigative series, set in New York's Chinatown and redolent of spice, threat, and complex cultures -- but that's only because I just wrote about his second book, YEAR OF THE DOG. Chang just nailed his first film option, with an independent film company that convinced him it would be able to sail well beyond the Charlie Chan image of Chinese detectives, to reach the dark reality of what he's writing. Chang grew up in Chinatown in a bicultural environment, "So I can present these stories is a way that's familiar AND exotic." He added, "I'm kind of like the town guide that's gonna take you into the underbelly, and I'm having fun doing it." "Outsiders are amazed by what they read in the book; insiders [today] don't go to the gambling houses et cetera" that house the tense action of Chang's Chinatown, he says. Bu there's one special way in which he connects his characters with his readers: through food. Everyone has a favorite Chinese dish, he believes, and he mentions many of them, along with foods that non-Chinatown folks will have to just imagine (and drool over) because they don't appear on the menu with General Tso's Chicken. An active parent whose writing schedule has to allow for picking up his child from school (or taking out the trash), Chang writes in longhand, three or four pages at a time, at whatever time of day he can grab. He usually does thirty to forty pages before starting to type up the material -- at which point he's already editing his pages as he transfers them to the computer. His third book, with a first-draft deadline of July, was about 75 percent done when he arrived in the Boston area last week, but with a schedule that includes a BEA (Book Expo America) appearance and much more, he'll need every minute and all of the exhilaration of that last stretch to get it all onto paper in time. Are Chang's neighbors worried that he's writing about them in his Jack Yu series? "Most of what I've written about Chinatown is 10 percent real. The neighborhood people are really just cheering me on." Some are shocked that he's translated their curse words into English, he admits wryly. "Nobody's chasing me down the street for my autograph, but it has got me a kind of notoriety -- more waiters (in the neighborhood) know that I write!" "Tuesday; An Art Project" -- Lives On! When art, photography, and poetry merge into a single project and a nifty packet of all the the above gets issued, it's understandable to wonder whether there will ever be another volume ... so I'm exhilarated to note that TUESDAY; AN ART PROJECT just completed its fifth issue (there are two issues per year), and is now offering two-year subscriptions. Brainchild of Jennifer S. Flescher, who's the editor (Advisory board: Ralph Angel, Jennifer Arin, Sophie Cabot Black, Teresa Cader, Greg Delanty, Thomas Sayers Ellis, Cate Marvin, David Rivard, Ravi Shankar, Don Share, A. J. Verdelle -- this should be ringing glad bells for many! ), this is a "journal" that comes wrapped in its own intricately folded sheet that serves as table of contents and statement of the issue. The inside sheets (mostly letterpress work from DWRI) are independent, unbound, except for a neatly printed "belly band" around the four-by-six-inch printed gems. Poems, photographs, and prints follow no particular order. In the spring 2009 issue, Mary Ruefle provides "Poem Written Before I Was Born," which offers a taste of summer, along with Ruefle's vaunted ability to surprise as she braids fruit, incarnation, and individual choice. Its central passage is "In the month of July / in the middle of the month / in hte middle of the day / in the month of that hour / I enter the nectarine world." Images are constantly worrying the world to allow them to become permanent. The photographer, sensing this, attempts to meet an unborn motion or stillness at its birth-moment. There's nothing sacred or instinctive about the process. The craft is interaction, a difficult interactive anonymity. The problem is being a body, forgetting that you are a body, so that the unborn photo will not fear becoming fixed. History does not exist without photography. It occurred before cinema and poetry. The photograph is purer than memory. The eye (not the mind) makes it so. OK, I'm not going to try to take that apart. But if it appeals to you -- along with the intricacy of a packet of poems and prints and photos -- you might consider subscribing. It's $25 for a two-issue year -- see www.Tuesdayjournal.org or write to Tuesday; An Art Project, PO Box 1074, Arlington, MA 02474. Dave and I love what Soho Crime has done for the international mystery scene: publishing series by authors who live or write from experience of international cultures. Meeting four of the Soho authors at once last week -- well, we couldn't pass it up, even though it called for a lot of driving. We'd seen photos of Garry Disher (Australia) and Henry Chang (New York's Chinatown) that matched pretty closely the authors as they strolled in. Reading all of Disher's Inspector Hal Challis investigations has been a huge treat; watching Henry Chang's career expand from his debut with CHINATOWN BEAT to last fall's YEAR OF THE DOG is a pleasure, and we shared the excitement as he told us he was about three-quarters done with the first draft of "book three." So Cara Black, creator of Aimée Leduc in an award-winning series of Paris mysteries, was the author we were most curious to meet in person. How French would she look? What kind of accent would she have? Coming in through the back door of Stellina's (a smashing Italian restaurant in Watertown, Mass. ), Black instantly brought that sense of Paris into the room. If those weren't French jeans she was wearing, I'll eat my page -- and Dave instantly fastened his gaze on her French sailor's scarf in bold stripes of black and white. And yes, when she speaks, even though she lives in California, her voice has the lilt and gentle hesitations of someone to whom French is a second linguistic home. For each one, Black travels again to Paris (often bunking on a friend's couch) and re-immerses herself in the feel of the neighborhood, while working out the plot. She does much of her writing in Paris too, but also in California, where she carries the scenes with her -- images on the wall, maps, more. Getting up in the morning, she writes, and she commented that if she doesn't check her e-mail, she gets a lot done! She said, "Once I've got to page 100, I've got my place [Paris neighborhood], and then I timeline it and I finish it and then I rewrite." One plus of listening to Black within the multiple-author event was the range of questions people asked, especially those who know this author well. Prompted by someone excitedly asking her to retell it, she revealed how her research led her to firing a gun with the Delta Force in Paris. Wow! Here's a link to that story in her own words. Most of all, I enjoyed hearing Black talk about Aimée Leduc and how the series is shaped around this computer security pro turned accidental detective. "Aimée is flawed, vulnerable," Black explains. "It makes a better story that way." And, she finds, this sets Aimée into the great tradition of the "lone detective." Of course, the effect can be a bit different on the other authors: After listening to how pleased Cara Black is that she has a framework of Paris locales that promises 20 Leduc detective novels (based on those 20 "villages" of the city), Henry Chang suddenly suggested, "I'll have to go to each of the fifty or sixty Chinatowns throughout the world!" More on Henry Chang and his writing, later this week. Thursday, June 4, at 7:30 p.m., The Collected Poets Series features the poetry of Massachusetts' current Poet Laureates, Lesléa Newman of Northampton and Gertrude Halstead of Worcester. 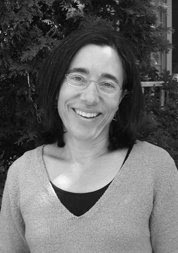 Eve Rifkah will be reading Ms. Halstead's work in Halstead's absence at Mocha Maya's, 47 Bridge St., Shelburne Falls, MA. 413-624-6292. Suggested donation $2 - $5. For more about the readings, don't forget to see www.collectedpoets.com . Gertrude Halstead was born in Germany in 1916. She escaped to France where during the war she was interned in the south of France. She volunteered to work as an interpreter and subsequently was allowed to be released. Halstead eventually made it to Portugal where she was able to get passage on the last ship leaving for the United States. She is a member of John Hodgen’s writing workshop. Halstead's work has appeared in Sahara, Diner VOX, Amoskeag , Nimrod, and Columbia Poetry Review. Her first collection is memories like burrs, ( Adastra Press, 2006). She has twice been nominated for the Pushcart Prize. Eve Rifkah was founding editor of the literary journal Diner and co-founder of Poetry Oasis, Inc. Her first chapbook is At the Leprosarium. Her book Dear Suzanne is forthcoming from Word Tech and a second book, Outcasts is forthcoming from Little Pear Press.